Stripper pad maintains consistent high performance throughout the life of the pad while it removes finish, sealer and contaminants from the floor surface. Uniform distribution of mineral abrasives throughout pad not just on the surface offers impressive performance and a long, useful life. Individually separated and coated fibers help produce more consistent results. 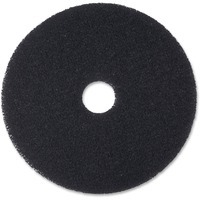 Use this standard stripper pad with rotary or automatic machine speeds of 175 to 600 RPM.